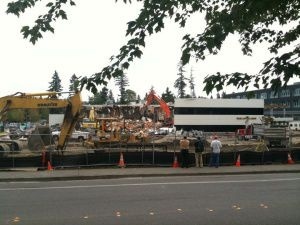 Nintendo of America's old headquarters - where mascot Mario supposedly got his name - has been bulldozed to the ground. Though I've never heard of the story as anything other than apocryphal, there is a popular maybe-legend-maybe-fact surrounding how the world's most recognizable videogame character got his name. After Nintendo of America moved from its old headquarters in New York City across the country to Redmond, Washington, then-president Minoru Arakawa noticed that the mustachioed landlord of their new building looked awfully like their nameless "Jumpman" character from Donkey Kong. His name was Mario Segale. And thus, Jumpman received a proper moniker - and considering that (if Segale had had a different name) we could have been playing Super Giovanni Bros? I think we lucked out. After remaining in the same headquarters for almost thirty years, however, Nintendo of America has moved to a shiny, more attractive new office - and the place where Mario was given his name has been demolished. A CVG reader sent pictures of the rubble to our colleagues on the other side of the pond, and while it doesn't look like anything more than a normal demolition site, I can't help but feel like I should be playing the classic "Game Over" music as I flip through the gallery. Of course, Nintendo big boss Satoru Iwata has high hopes for the new place, saying that he believes the new HQ "will help employees to be even more creative and productive, and continue to put smiles on the faces of our consumers." He's probably not wrong; it's always nice to move into a nicer, better work-space. But couldn't they have left the old building standing? You're destroying a piece of history, people! More pictures of the demolition can be found over at CVG.